You don't have to wander long in the liberal commentariat to find projections that the Republican Party is in a death spiral, doomed by demographics, discredited by the dissension among House Republicans, disenchanted with its experienced presidential candidates and despised by the great mass of voters. There is something to be said for each of these propositions -- and yet Republican candidates keep winning elections, as in recent contests in Kentucky, Louisiana, Mississippi and Virginia. Admittedly, the first three of these states have been solidly Republican in recent presidential and congressional elections, and Americans have increasingly been straight-ticket voters. But state issues do give a non-dominant party a chance to reframe issues across national party lines. And Virginia was the state that voted closest to national percentages in both the 2008 and 2012 presidential elections. The Kentucky result was particularly striking. Retiring Democratic Gov. Steve Beshear was a big booster of Obamacare and extended Medicaid to many low-income Kentuckians. The Democratic nominee, Attorney General Jack Conway, is an adept politico. 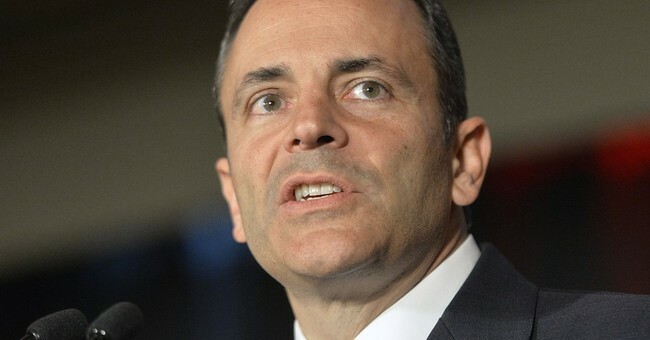 Republican nominee Matt Bevin was distrusted by insiders for running in the primary against Sen. Mitch McConnell in 2014, and he had a business record open to attack. Democrats spent about $9 million to Republicans' $5 million. The RealClearPolitics average of public polls showed Conway leading 44 to 41 percent. But Bevin won by 53 to 44 percent. Conway carried the state's two largest counties, containing Louisville and Lexington. But Bevin carried 106 of the 118 others. As in McConnell's race, the Democrat matched pre-election poll numbers. The Republican exceeded his. What may be happening is that Republicans are disgruntled with party leaders; their disapproval is largely responsible for the Republican Party getting more unfavorable ratings than the Democratic Party. While they won't outwardly commit to voting Republican, on Election Day they do. This would explain similar phenomena in the 2014 races in Kansas and Virginia. The results in Louisiana and Mississippi were similar. In Louisiana's all-party primary Oct. 17, three Republican candidates got 57 percent of the vote and three Democrats 42 percent. But the single prominent Democrat, John Bel Edwards, got 40 percent, and the winner among three prominent Republicans, Sen. David Vitter, got only 23 percent. Vitter, like Bevin, has weaknesses as a candidate and could lose the Nov. 16 runoff. As for Mississippi, Republican Gov. Phil Bryant was re-elected with 67 percent of the vote in a race that wasn't seriously contested. Some Democrats dismiss their losses as the result of low turnout. Wait till turnout rises to presidential-year levels, they say, and it's inevitable that Democrats will do fine. Maybe so, but it was Democratic more than Republican turnout that lagged. Kentucky, Louisiana and Mississippi Republicans got more votes than their party's candidates have in all but a few past elections. But in Louisiana and Kentucky Democrats got fewer votes than their counterparts have in elections (except for 1999, not seriously contested in either state) since 1972 and 1967, respectively. The last time a Mississippi Democratic governor candidate got fewer votes was in 1963. This happened even though Mississippi and Louisiana have higher percentages of blacks than any other state. Spontaneous heavy turnout by blacks made these states two of only five to give Barack Obama higher percentages in 2012 than 2008. But without Obama on the ballot, black turnout dropped sharply -- not a good sign for Democrats in 2016 and beyond. We have been told frequently that a surge of "ascendant" Americans -- blacks, Hispanics, Asians, millennials -- into the electorate will move it inexorably toward Democrats. But so far the surge hasn't happened. Turnout, particularly Democratic turnout, declined from 2008 to 2012 presidentially and from 2010 to 2014 congressionally. Barack Obama got 3.5 million fewer votes in 2012 than 2008. Let's finish with Virginia, where Democratic Gov. Terry McAuliffe and former New York Mayor Michael Bloomberg spent millions to win control of the state Senate. They fell short: Republicans maintained their edge and lead 66-34 in the Virginia House of Delegates. If you add up the votes cast in the state Senate contests, Republicans won 53 percent and Democrats 44 percent -- the same numbers as the gubernatorial race in Kentucky. That's not necessarily a forecast of the 2016 result in the nation's current bellwether state. But it doesn't look like a death spiral for Republicans.